The Malabar pit viper, also know as rock viper, is a master of camouflage. It is venomous and deadly in its precision when striking its prey. These nocturnal reptiles are found on ground rocks and trees near streams in South-western India. Vipers are the most efficient venomous snakes of all. Their long fangs can inject venom deep into a victim. The venom acts mainly on the blood and muscles of the prey. Vipers usually have short, thick bodies and triangular heads covered with small, ridged scales. There are two main groups of vipers. 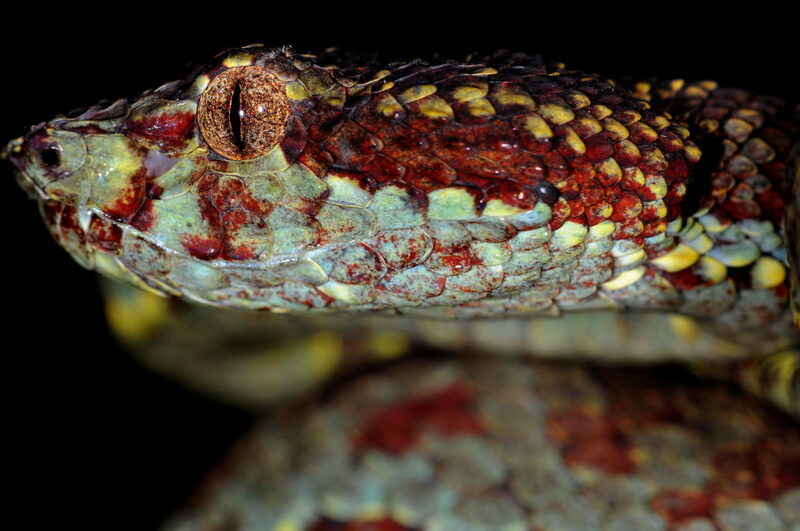 Pit vipers have large heat-sensing pits on the face, unlike other vipers who are without this ability. These large heat sensing pits are located on each side of its head, between the nostril and the eye. Sometimes the heat pits are larger than the nostril. It can detect the heat given off by warm-blooded prey. 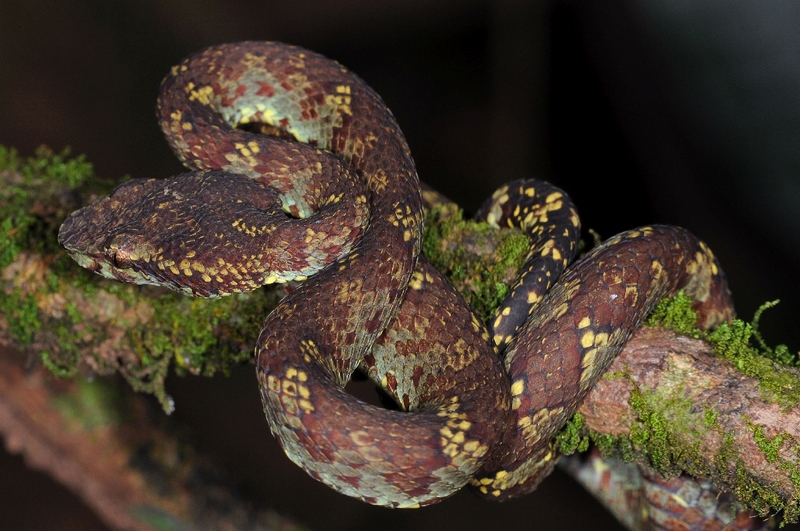 By turning its head from side to side, a pit viper can figure out the direction of its prey. These vipers live in thick forests, mainly on the trees. Its coloring means that it is well camouflaged against the green leaves. It lies in wait for its prey and then kills it with a quick bite. Once the prey has been caught, the snake must hold tight to stop it from falling out of the tree. This is Malabar Pit Viper (Trimeresurus malabaricus). This particular Pit Viper is a pale green snake with faint, uneven dark green/brown blotches on the back. But there is tremendous variation in their coloration, as we saw a similar pit viper just a few meters away which was much darker with brown/black color. The head is wide and triangular, set on a thin delicate neck. Pit Viper is a slow-moving snake and nocturnal. They rely on camouflage for protection. Although slow to defend themselves, they are capable of fast strikes and bites if disturbed. The food of this snake consist of small mammals like rodents, lizards, birds and frogs. The females give birth to 4 or 5 living young. This is also Viper speciality as other snakes lay eggs. The eggs develop inside the mother’s body surrounded by transparent bags, called membranes. While the baby snake is developing inside the mother, it gets its food from the yolk of the egg. The female viper usually gives birth in a hidden place, where the young are safe from enemies.